When Megan O’Malley got the call to join the Ringling Bros. and Barnum & Bailey® band, she was concerned. “Initially I was apprehensive,” she says. “The trombonist before me was also a woman. I wondered what she was like and what the band’s impression of her might have been and how that would affect me.” Most might find such a reaction to be rather strange. However, most of us will never know what it’s like to be the odd man or woman out. Most will never know what it’s like to exist in various segments of society as an anomaly. To enter such a world and attempt to make your way, as unfair as it might be, marks you as the catalyst whose presence and efforts either blaze a trail or burn the bridge for those who wish to follow. This was the unspoken concern that echoed from O’Malley’s consciousness. The Pennsylvania native is as unassuming as she is talented. In no way is she looking to galvanize a movement; she’s just a lady who loves to play her horn. However, even in this day and age, despite notable and even celebrated female trombonists from the likes of Melba Liston to Abbie Conant, women and the trombone tend to be a rare pairing. 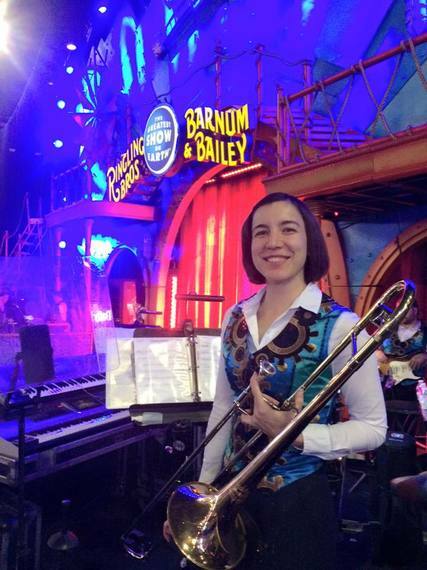 Even for Megan O’Malley, the trombone was not her first choice. For O’Malley and her sisters, it was the piano and clarinet. It wasn’t because they were drawn to these instruments or even music, their stepmother simply believed that musical training would make them well-rounded and proper ladies. “Unfortunately, neither my sister or I would become ‘proper’ ladies,” she laughs. However, at least for O’Malley, music would become a serious part of her young life. At the insistence of her middle school band director, O’Malley would take up the trombone and never look back. “I like what the trombone does. It anchors what everyone else is playing,” she says. For most of her musical education from high school to her post-graduate studies, O’Malley would often be the only woman in her program. “In high school during band competitions, it was just me and twenty guys,” she says. “I’d enter a room and no one would take me seriously, but I didn’t care, they were my competition.” The auditions for these competitions were blind, meaning the judges would not be facing any student as they played. O’Malley often excelled in such a format. “For some guys it was a shock; it hurt their pride to see me there,” she says. “I learned to just let it happen. Let their pride be hurt. Usually at the end of a festival they’d be over it. The judges didn’t see them, they didn’t see me, it was just trombone playing.” In essence, it was that experience so many of us hope for in every segment of society — fairness; a chance for your talent or ability — nothing else, to determine your fate. The great equalizer, however, is the struggle that awaits so many aspiring artists. Even with a hard-earned master’s degree in tow, O’Malley found herself working 12 to 18 hour days at a variety of odd jobs from office assistant to projectionist at a movie theater, sometimes working more than two jobs at a time — none of them in music. Sure, there was the occasional gig at Busch Gardens or Community Orchestra, but nothing like she intended or worked so very hard to achieve. “It was hard. I thought about quitting a lot,” she says. “No matter how many jobs I had, I couldn’t break even.” It’s a very tough place to be in. It’s a place where doubt and fear attempt to take up residence, in hopes of convincing you that your dreams can’t possibly be realized. It’s a dark and heavy place for which the sole comfort is endurance.